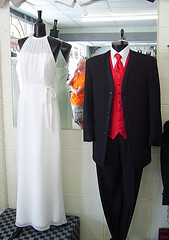 Prom dresses and tuxedos – what’s all the fuss about? Do you think public school dress codes should prohibit girls from wearing tuxedos or boys from wearing dresses to the prom? There have been several challenges to these restrictions over the past ten years. In 1999, an Arlington High School senior succeeded in getting a court order allowing him to wear a dress to the prom. In 2006, a transgender student was turned away at the door of his West Side High School prom because he was wearing a gown. It is well established that students have free speech rights. Does that include the freedom to express yourself by dressing as the opposite gender? What do you think of gender-based prom dress codes? Would this have become an issue if she was heterosexual and wanted to wear a tux to the prom? A few weeks later, the school reversed its tuxedo policy. They stated that all students are to wear appropriate formal attire with no gender-based requirements imposed. Find out more about gay students’ rights. That is simply not right, you should be able to wear what you like. I’m a boy and I wore a prom dress to the prom and I took my boyfriend with me (he wore a tux). There were 5 other boys in dresses and 3 girls wearing tuxes. There were over 100 of us there and everything went fine. Thanks so much for sharing this with us, Andrew. It sounds like you go to a school with a very accepting and respectful environment.